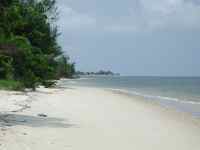 Point Denis has Gabon's best known beach resorts and is a popular excursion from Libreville. It is a peninsula dividing the Atlantic Ocean and the Gabon Estuary, with some mansions, lodges and restaurants on the city-side and wilder, more pristine stretches of beach on the ocean-side. Point Denis is a beautiful place, easily reached by a 30-minute ferry ride from Libreville. For thrill seekers the peninsula is also reachable by jet ski, and the ride takes about 30 to 40 minutes. The beaches at Point Denis are some of the best in the country, the shoreline is perfect for long strolls and it is easy to find a secluded spot to enjoy paradise privately. There are palm trees for shade and the sea is generally very calm and good for swimming. There are several beach bars and seafood restaurants strewn along the coast and for those that want to spend a few days there are lodges, bungalows and camping facilities. It is also easily possible to avoid all the development and picnic somewhere wild and unspoiled. Take a break from the sun, sea and sand by hiking right off the beach into the jungle, or take a guided jungle safari to seek out wildlife. A visit to Point Denis is fun for the whole family and it is a favorite weekend getaway for locals, expats and tourists. While Point Denis offers some of the best untouched stretches of beach and nearby rainforest, be aware that safety can be compromised by quick sand and wildlife. In addition, remember to respect the forest as it is a sacred place for locals and be sure not to infringe on any sacred rites or ceremonies.